It is the underbelly of India’s electronics and e-waste industry, but a new study has shone some light on just how dangerous working with scrap electronics can be for Indians. “All recyclers and dismantlers are suffering from breathing problems such as asthma and bronchitis and have a detrimental effect on the respiratory, urinary and digestive systems, besides crippling immunity and causing cancer,” said the study on ‘Electronic Waste Management in India,’ conducted by The Associated Chambers of Commerce and Industry of India (ASSOCHAM) on “Environment Day”. About 76% of e-waste workers in India suffering from respiratory ailments like breathing difficulties, irritation, coughing, choking, tremors problems who all are engaged in various e-waste (electronic waste) activities due to improper safeguards and dismantling workshops, it added. And it’s not just the e-waste workers who are impacted: You can be too, as e-waste leads to leakage of heavy metals like lead into the water and soil. Of the total e-waste generated in India, approximately 1.5 percent is recycled by formal recyclers or institutional processing and recycling. Another 8.0 percent of the e-waste generated is rendered useless and goes to landfills. The remaining 90.5 percent of the e-waste is being handled by the informal sector, adds the paper. The new Indian Government has recently launched “Swachh Bharat Mission” or “Clean India Mission” which aims to mobilize masses and seeks to create a clean India whereas there are ten states that contribute to 70 per cent of the total e-waste generated in the country, while 65 cities generate more than 60 per cent of the total e-waste in India. Among the eight largest e-waste generating states, Maharashtra ranks first followed by Tamil Nadu (2nd), Andhra Pradesh (3rd), Uttar Pradesh (4th), Delhi (5th), Gujarat (6th), Karnataka (7th) and West Bengal (8th), adds the study. The main sources of electronic waste in India are the government, public and private (industrial) sectors, which account for almost 71 per cent of total waste generation. The contribution of individual households is relatively small at about 16 per cent; the rest being contributed by manufacturers, Assocham said. Though individual households are not large contributors to waste generated by computers, they consume large quantities of consumer durables and are, therefore, potential creators of waste, reveals the ASSOCHAM study. For the recycling of e-waste, India heavily depends on the unorganized sector as only a handful of organized e-waste recycling facilities are available. Over 95% of the e-waste is treated and processed in the majority of urban slums of the country, where untrained workers carry out the dangerous procedures without personal protective equipment, which are detrimental not only to their health but also to the environment. While releasing the paper, Mr. D S Rawat, Secretary General ASSOCHAM said, e-waste is directly linked to the economic growth of the country and overall consumer spending. India’s economic growth has lifted millions of people from lower-income group to middle- and high-income groups, increasing their purchasing power. E-waste typically includes discarded computer monitors, motherboards, Cathode Ray Tubes (CRT), Printed Circuit Board (PCB), mobile phones and chargers, compact discs, headphones, white goods such as Liquid Crystal Displays (LCD)/ Plasma televisions, air conditioners, refrigerators and so on. With increasing use of these in our everyday life, e-waste is also piling up. The biggest e-waste recycling market in India is Delhi and approximately 40 percent of the e-waste in India lands here. Bangalore and Chennai are the next big e-waste markets. Chennai is the fourth largest e-waste generating city and approximately 5.0 MT of e-waste is generated every day in the Chennai Metropolitan area. Commenting ASSOCHAM findings Dr. B K Rao, Chairman of ASSOCHAM Health Committee said, “Computers, televisions and mobile phones are most dangerous because they have high levels of lead, mercury and cadmium — and they have short life-spans so are discarded more”. In the last ten years, there is about 83.5% increase in the sales of domestic household appliances, both large and small all over the world. Electronic equipments contain many hazardous metallic contaminants such as lead, cadmium, and beryllium and brominated flame-retardants. The fraction including iron, copper, aluminum, gold, and other metals in e-waste is over 60%, while plastics account for about 30% and the hazardous pollutants comprise only about 2.70%. Dr. Rao further said, Children are particularly vulnerable to lead poisoning – more so than adults because they absorb more lead from their environment and their nervous system and blood get affected. 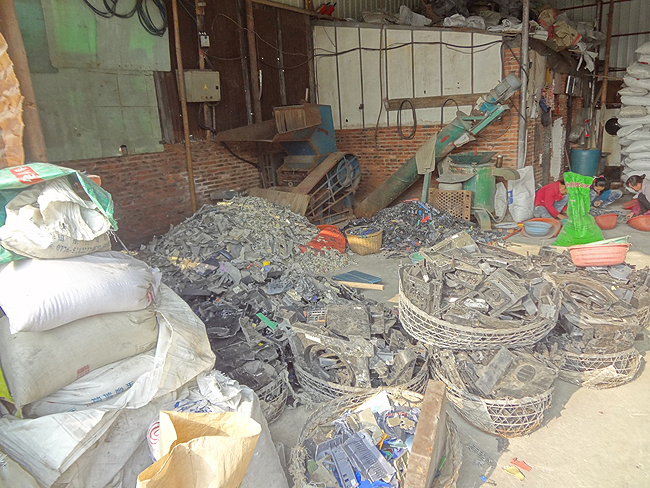 A large number of workers are involved in crude dismantling of these electronic items for their livelihood and their health is at risk; therefore, there is an urgent need to plan a preventive strategy in relation to health hazards of e-waste handling among these workers in India, added Dr. Rao. E-waste, which includes discarded cell phones, computers, printers, and TVs, has been linked to risk factors for cardiovascular disease and possibly cancer. Researchers now say pollutants released from e-waste can have lasting, damaging effects on human health. Despite the Indian government stringent law to regulate e-waste trade, destitute children still face hazards picking apart old computers, TV etc. The chamber has also strongly advocated the need to bring out effective legislation to prevent entry of child labour into its collection, segregation and distribution.